FDA registered homeopathic HGH sprays have been providing good benefits for years. 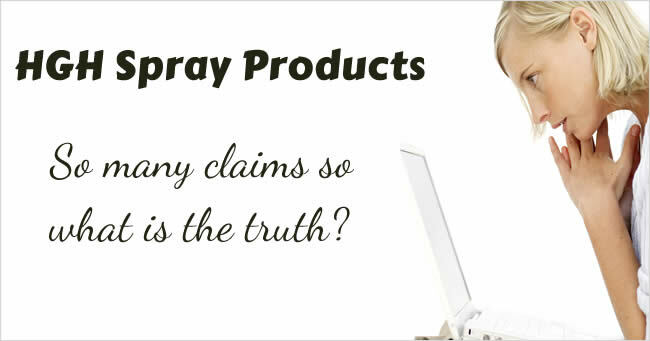 However, some companies try to sell their spray products by claiming they are something they are not. Several months ago a multi-level marketing company came out with an HGH gel product that contains 30X of homeopathic human growth hormone and it is rubbed on the skin. I have been told by at least 10 people who either joined or were asked to join the MLM company they are telling everyone that the sprays don't work because the saliva kills the HGH. This is absolutely not true! Please see my article for more information about this issue. I also compare the gels to the sprays. Some companies and/or their distributors claim their spray contains some new special delivery system such as a "polymer matrix" molecule delivery system or another type of delivery system. They may claim this new special delivery system is used with their product only. One claim is that only they are allowed to use the special delivery system because only their product is a "supplemental HGH" or "ingestible HGH" product that can provide a pharmaceutical dose of HGH like the injections do. Another claim is that only their product can use the special delivery system because it is not FDA approved. Of course these statements are completely untrue but some customers are being told hype such as this by companies, distributors, and/or their web sites. According to their claims their special delivery system now allows the entire human growth hormone molecule to be absorbed intact under the tongue and so their spray product is not homeopathic but is instead just like the injections. They claim this miraculous new delivery system takes each molecule and twists and squeezes and reshapes it into a shape and size that will pass through the mucosa of the mouth easily. If there were a delivery system that actually could do all that it would indeed be special! Insulin users the world over would surely rejoice since it would mean they would no longer need to inject themselves with insulin, they could instead just spray it under their tongue. The insulin molecule is only about half the size of the human growth hormone molecule yet it is also too large to be absorbed under the tongue, unless it is in homeopathic form. The companies and distributors making these claims are ignoring the fact that any human growth hormone that is not homeopathic cannot be purchased without a prescription and so the FDA would not allow them to sell such a product over the counter if it did exist. These distributors are probably hoping that people will not question their statements and claims. After all, the name of their special delivery system sounds so technical and impressive that it must be true. They are hoping people will think this way and will purchase their product, and many are doing just that. A Great New Invention or HGH Sales Hype? The invention of a delivery system that would allow large protein molecules such as the growth hormone molecule to be absorbed under the tongue would indeed be a great advancement in medicine and would most certainly not be limited in use to only one specific non-prescription product. Through the years millions of dollars have been spent on research trying to find a way to pass the large protein molecules into the body intact without the use of injections. Progress has been made in the area of nasal sprays delivering smaller molecules such as insulin by inhalation but at this time non-homeopathic human growth hormone must still be injected. Delivery systems are indeed used in high quality homeopathic sprays like our ProBLEN products but not for the reasons mentioned above that some competitors like to claim. Such systems are used to enhance delivery of the homeopathic ingredients into the body. Please note, with real homeopathic products the properties (electromagnetic energies) of the HGH molecules are transferred into the lattice of the water molecules in the liquid base solution of the product. It is this potentiated solution that is then absorbed under the tongue successfully. There are now some sellers who claim you should buy their product because they alone use an organic vegetable base solution in their spray. They claim that all the other spray products contain petroleum in their base solution and they warn that the petroleum can damage the lymph system, liver, or cause other damage. Of course I cannot say what each and every product on the market contains and there are now many products being made outside the United States, however, I can say that our ProBLEN products do not contain petroleum and they will not damage or clog the lymph system, liver, or any other system or organ in the body. Our sprays use a vegetable base solution (organic vegetable alcohol and purified water). Products such as ours that have been awarded an NDC registration number must adhere to the strict guidelines of the FDA. These are the sort of claims that sellers use when their products have not had any independent IGF-1 clinical studies. They know they must come up with some reason why customers should buy their product. There seems to be no end to the hype that some come up with when trying to sell a product that has no legitimate clinical studies to prove effectiveness.